Quito (02/03/2015) Ecuador made history in the Super Bowl, the biggest sporting event in the United States and one of the four most watched worldwide. With a 30-second spot during halftime of the final football, fate Ecuador was promoted this February 1st to millions of Americans. The commercial showed, through spectacular images, what the country has to offer in its four worlds: history, culture, adventure and endless natural beauty. The figures show that the campaign All You Need Is Ecuador (AYNIE) presented in the Super Bowl was a resounding success with over 133 million hits. Television: The spot reached 66 million people (10% more than expected) in the cities where the announcement was prescribed. These were New York, Los Angeles, Chicago, San Francisco, Houston, Seattle, Boston, Denver, Dallas, Philadelphia (includes New Jersey), Washington, DC, Atlanta and Miami. Social Networks: From January 26 to February 5, social networks experienced significant movement. On Facebook, publications on All You Need Is Ecuador reached 63.44 million impressions; on Twitter, there were 1.99 million impacts. 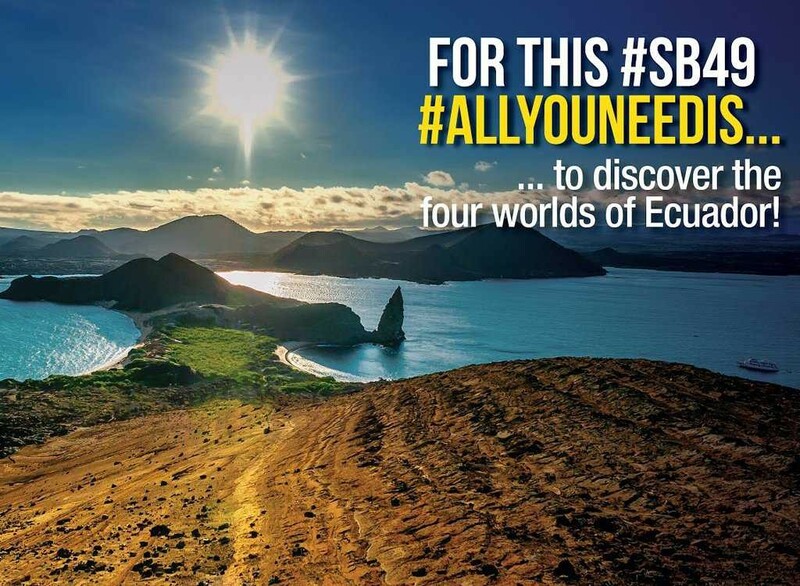 The hashtag became #AllYouNeedIsEcuador trend in Ecuador and several US cities during the hours in which the game was played. YouTube was no exception, AYNIE video had 520,000 views. Website: During the same period, the ecuador.travel website and its promotional pages, where information about the country as well as the various tourist packages to visit Ecuador was shared, had 904,511 views (75% from the United States). Also, more than 236,000 people around the world visited many international and local web sites that appeared information and promotion campaign, which, in turn, re-diredict users to ecuador.travel website. Free Press: The great expectation generated by the campaign, managed to talk about the presence of All You Need Is Ecuador in the Super Bowl media as the Wall Street Journal, Miami Herald (Spanish version), LA Times, BBC, CNN, CNN Money (who awarded the gold medal commercial Ecuador in the Super Bowl), CNN Mexico, Colombia Caracol Radio, Telemundo, Peru RPP News, Univision, ABC News, El Clarin (Argentina), Argentina (Costa Rica) Bloomberg; and in specialized media like BBC Travel, Travel Pulse, Yahoo Travel, Orbitz, Despegar.com, and Travel & Leisure. After this and other actions, it is expected that the number of US visitors grow 5% compared to 2014. This increase can be solved by the tourism sector of the country that has the necessary infrastructure. In the last seven years has invested USD 351 million in airport infrastructure, hence Ecuador count with 14 airports (2 of them international). Additionally, there are at present 22 hotel investment projects, 10 of which are already under construction and the rest start it during the second half of 2015. Major hotel chains like Holiday Inn, Eurobuilding, Wyndham, Ibis, Sheraton, among others, within these 22 projects and to signify the country about USD 650 million in investment. The country now has a road network of the first order and a consolidated offer lodging and travel. All this momentum allowed to continue working on improving the quality of tourism services, which is a priority and central axis of action for MINTUR in this 2015.